BECAUSE WINTER has always represented an important period of retreat and rest, long nights to help us catch up on our sleep and rejuvenate body and soul, crafting soothing, sleep-enhancing Dream Pillows is a perfect way to celebrate the season. There are many herbs that help relax and calm us, such as lavender, catnip, rose petals, hops, chamomile, lemon balm, lemon verbena, sweet marjoram, and passionflower. When making the pillows, a combination of two or three favorites works very well. If you are using hops, however, just know a little goes a long way. While it is a most potent relaxer, it does have an unpleasant odor. Be sure to mix sweeter smelling herbs with hops to mask its scent. You can find the herbs at your local natural food store, organically grown, dried and ready for use. After making my first dream pillow years ago, I started growing my own — most of which are perennials that come back year after year in the garden. I like to harvest my sleep pillow herbs on the day of summer solstice, hang them to dry naturally in the warm dry shade under the eaves of my house and then store them until I’m ready to make a new batch of pillows come winter. They make lovely handmade holiday gifts. If you sew, you can make your own custom pillows: squares or rectangles are easiest. If your sewing skills allow: hearts, stars, circles or crescent moons make especially sweet pillows. Tucked into pillowcases, they do not have to be large. I found a medium-sized pillow that is relatively flat after filling works best as it stays in place better. You can use scrap material, buy remnants from the fabric store, or use old bandanas. You can sew them by hand or machine, or if you don’t sew at all, you can use ready-made natural fiber sachet bags, the kind you can usually find right in the bulk herb section. 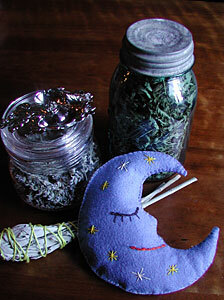 Felt can also be used, as the above illustration shows, a Blue Moon sleep pillow I made last year in wool felt. With felt you can easily (no hoop needed) add embroidered designs and symbols to enhance potency. When the herbs lose their scent, just crush the pillow a bit. You can also recharge them with drops of lavender essential oil. 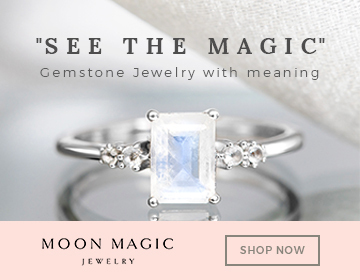 I also like to add small, polished stones, tucked into the pillow with the herbs that are known to soothe and reduce stress: Moonstone, Selenite, Onyx, Blue Jade, Amethyst, Prehnite, Rose Quartz, and Lepidolite are some that I’ve used. Bells, candles, Yule logs of oak or holly, wreaths, stars, the crown of light, the evergreen tree, holly, ivy, and mistletoe, the “Golden Bough” of the Druids, are all emblematic of the season. Mistletoe, in particular, is an ancient symbol for life essence, fertility, and immortality honored at the depths of winter. According to J.C. Cooper’s Illustrated Encyclopedia of Symbols, the evergreen mistletoe represents the sacred feminine principle, with the oak its male counterpart, on which this (usually non-damaging) semi-parasitic plant commonly grows. Cooper adds that mistletoe was once believed to be the result of lightning strikes to the branches of oak trees and was thus imbued with special spiritual qualities. The evergreen mistletoe no doubt came to represent everlasting life at winter solstice as it is only really visible this time of year. Only after the oak has dropped its leaves and slipped into a deathlike, winter slumber, do we see it, still lush, green, growing — fruiting even — hanging in rounded masses from the oak’s bare branches. Birds relish mistletoe fruit, its pearly white berries, an important winter food source. If you’re worried about the oaks, don’t be for mistletoe spreads and grows relatively slowly and only rarely becomes a threat to the tree’s health. And no doubt, in those cases, probably due to other ecological imbalances. Healthy trees are able to tolerate a few mistletoe plants with little harmful effect. Moreover, when trees are laden with mistletoe, it is often a sign of a healthy bird population. DRINK IN THE STARK BEAUTY of our planet at this reflective time of year. If you light a bonfire, campfire, hearth fire, or even a simple candle, in honor of this “turning of the wheel” of the solar year, you are reviving a practice that stretches back through millennia. Observing and honoring these ancient, natural “holy days” helps the entire world revive and heal a split that has gone on way too long between Mother Earth and her human children. May this solstice bring blessings of peace and happiness to you and your loved ones, and to Mother Earth herself.